On the next pages you will find a more precise map and more information on those Slavic ethnic groups. LOOK ESPECIALLY AT slavia-slavialand13.tripod.com and slavia-slavialand14.tripod.com if you want to know more about Slavic ethnic groups. On this map we more precisely show the distribution of the Slavic languages in Europe in 38 figures. 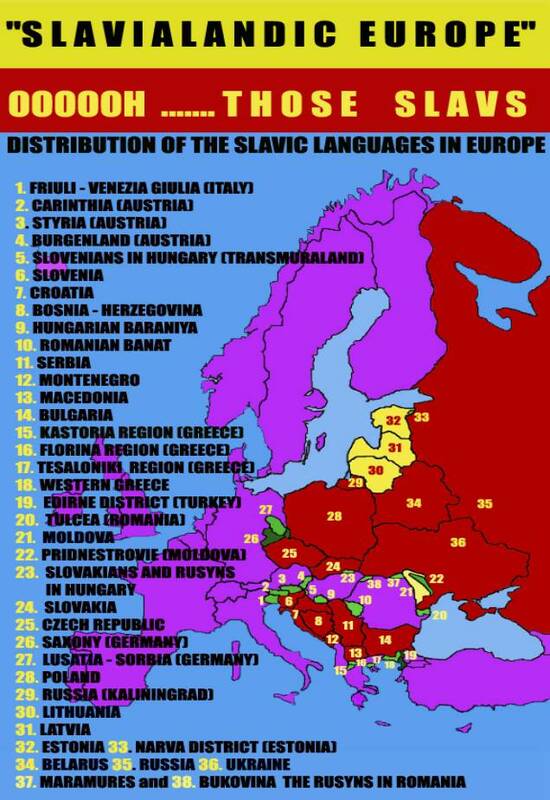 On the map we can see in red color the 13 official Slavic states in Europe + the 25 other parts on the European continent where there traditionally live ethnic Slavs. Those territories are in yellow and green. In yellow are shown Estonia, Latvia, Lithuania and Moldova as non-Slavic countries with the highest percent of Slavic population. Lets explain more precisely. Number 1 - FRIULI-VENEZIA GIULIA, region in Italy with more than 100,000 ethnic Slovenians. Number 2 - CARINTHIA, region in Austria with more than 30 000 Slovenians. Number 4 - BURGENLAND, GRADIŠĆE region in Austria with more authentic Slavs out of the Slavic states. The BURGENLAND CROATS came from Croatia many years ago, but they still keep the authentic and original 'old croatian language', which is not any more in use even in Croatia. The official language of Croatia today is a little bit different from it, not much, but anyway different. It is very fascinating that this small group of about 30 000 people have saved their own original language for many years, far away from their home country and surrounded by a German majority. If we speak about other Slavs out of the Slavic states, they have a different position, for example the Slovenians in Italy or Austria, but the fact is that they have a border with Slovenia, and it is usual that people mix near country borders. Croats in Burgenland don't have a border with Croatia. Number 5 - "TRANSMURALAND", region in Hungary with traditionally ethnic Slovenians. Number 6 - Slovenia, the most "western" south Slavic land, high on the Alps. Slovenia is the first Slavic country that became the member of the European Union. Even in the time of the SFR Yugoslavia, it was the most developed republic, and it still today has the highest standard of living. I personally think the Slovenians can be an example for the other Slavic states when we speak about organization inside the states. SLOVENIA - SLOVENIJA has an area 20 300 km², and population 2 011 000, the capital is LJUBLJANA. Number 7- Croatia, the south Slavic land with the biggest and nicest part of the Adriatic coast. CROATIA - HRVATSKA has an area 56 600 km², and population 4 497 000, the capital is ZAGREB. Number 8 - Bosnia and Herzegovina, the south Slavic state where three big world religions meet among the same south Slavic people. We believe the one day this fact will symbolize our idea of "united in diversity by love peace and freedom." BOSNIA AND HERZEGOVINA - BOSNA I HERCEGOVINA - БОСНА И ХЕРЦЕГОВИНA has an area of 51 200 km², and population 4 008 000, the capital is SARAJEVO. Number 9 - Hungarian Baraniya, region in Hungary with traditionally ethnic Croatians. Number 10 - Romanian Banat, region in Romania with traditionally ethnic Slavs, mostly Serbs and Bulgarians Palityans. Number 11- Serbia, one of the biggest south Slavic states and the biggest south Slavic People. SERBIA - СРБИЈА has an area of 88 361 km², and population 9 396 411, the capital is BELGRAD - BEOGRAD- БЕОГРАД. Number 12 - Montenegro, the smallest south Slavic state. MONTENEGRO - ЦРНА ГОРА - CRNA GORA has an area of 13 812 km², and population 650 575, the capital is PODGORICA - ПОДГОРИЦА. Number 13 - Macedonia, the most southern of the south Slavic states. MACEDONIA - МАКЕДОНИЈА has an area of 25 700 km², and population 2 071 000, the capital is SKOPJE - СКОПЈЕ. Number 14 - Bulgaria, territorially the biggest south Slavic state. BULGARIA - БЪЛГАРИЯ has an area of 111 000 km², and population 7 518 000, the capital is SOFIA - СОФИЯ. Numbers 15, 16 and 17 - Kastoria, Florina and Tesaloniki regions in Greece with ethnic Slavs. In these three regions of Greece live there are more than 180 000 Slavic Macedonians. Number 18 - WESTERN GREECE, region in Greece has a border with Bulgaria. Approximately 30, 000 ethnic Slavs mostly Bulgarians live in three provinces there. Number 19 - Edirne district, region in Turkey with ethnic Slavs. Traditionally Bulgarian Pomaks live there. Number 20 - Tulcea, region in Romania, 40 000 Lipovans live there, Slavic ethnic groups of Russian origin (Russian old believers). Number 21 - Moldova, a state shown in yellow on the map as a country with high percentage of ethnic Slavs, about 1 600 000. Number 22 - "PRIDNESTROVIE" is a part of Moldova with a Slavic majority. The capital is TIRASPOL – TИРАСПОЛЬ. Number 23 - a part of the north - eastern Hungary with small groups of ethnic Slovakians and Rusyns. Number 24 - Slovakia, a west Slavic country in the high Tatras. SLOVAKIA - SLOVENSKO has an area of 49 000 km², and population 5 424 000, the capital is BRATISLAVA. Number 25 - Czech Republik, a west Slavic country. CZECH - ČESKÓ has an area of 78 900 km², and population 10 246 000, the capital is PRAGUE - PRAHA. Number 26 - SAXONY, region in Germany with traditionally ethnic Slavs, mostly Poles, about 200,000 people. Number 27 - LUSATIA or SORBIA. ŁUŽICA - ŁUŽYCA Lusatian Sorbs is the smallest Slavic nation, about 60 000 people in Upper and Lower Lusatia. Just like we write in the beginning, the Slavic Union will support the idea about the high cultural autonomy for LUSATIAN SORBS inside the German state. Number 28 - Poland, the biggest west Slavic state and the largest west Slavic nationality. POLAND - POLSKA has an area of 312 700 km², and population 38 626 000, the capital is WARSAW - WARSZAWA. Number 29 - KALININGRAD, a part of the Russia at the Baltic Sea. Number 30 - LITHUANIA, country shown in yellow on the map, ex-Soviet state with an ethnic Slavic population of 700 000. Number 31 - LATVIA, country in yellow on the map, ex-Soviet state with the biggest percent of ethnic Slavic population. In Latvia there live about 1 100 000 ethnic Slavs. Number 32 - ESTONIA, country shown in yellow on the map, ex-Soviet state with a high percentage of ethnic Slavic population. In Estonia there live more than 500 000 ethnic Slavs. Number 34 - Belarus, an east Slavic state. BELARUS - БЕЛАРУСЬ has an area of 207 600 km², and population 10 311 000, the capital is MINSK - МИНСК. Number 35 - Russia, the biggest of the east Slavic states, and the biggest Slavic nation, the biggest country in the world. RUSSIA - РОССИЯ has an area of 17 075 400 km², and population 143 782 000, the capital is MOSCOW - МОСКВА. Number 36 - Ukraine, an east Slavic state, and one of the biggest Slavic and European countries. UKRAINE - УКРAЇНА has an area of 603 700 km², and population 47 732 000, the capital is KIEV - КИЇВ. Number 38 - Bukovina region in Romania with also a small group of ethnic Rusyns. Maybe our map is not the most complete and the most precise, but it is one of the first of its kind, at least I haven't seen anything similar before. It is not definite, and it will gradually be completed in the future. Shortly, it is an effort to show all the Slavic states and all the ethnic Slavic groups in Europe. On the map we, of course, don't show the vast Slavic diaspora around Europe (not those Slavs who have come after the Second World War to work temporarily in western countries). The map only shows the Slavic states and European territories with traditionally ethnic Slavic people.